There are lots of creepy things in the world: monsters, graveyards, dark closets, wide-open spaces under your bed, cafeteria “mystery meat,” full moons... But we think everyone can agree with the absolute creepiest thing in the entire world: spiders. Honestly, spiders are just hands-down terrifying. Maybe it’s the fact that they have eight legs when any normal, good creature has, at maximum, four. Maybe it’s because they hide out in cracks and corners, just waiting to dart out when you least expect it. Maybe it’s because they create those nearly invisible webs that you don’t see until it’s too late and you’ve walked right into them. At any rate, spiders seriously give us the heebie-jeebies, and we know we’re not alone in that. But that also means that this Wicked Spiderina Witch Hat is the perfect accessory for a creepy, kooky Halloween costume. 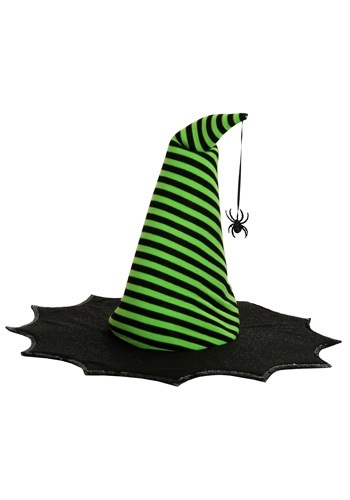 The polyfoam hat has a black brim sprinkled with glitter and a green-and-black striped conical crown. The brim is edged with silver sequins for extra glitz—and a cute spider dangles off the top for a special flair. This is probably the only hat we’ve ever seen that manages to make spiders look cute! Pair it with our Spiderina costume and bag, a broom and a wig for a complete look! I don't know why the hat doesn't come with the costume. It's a cute hat.